← Sleep ….. Sleep …..s-s-sSNORE!! When you do the program, it’s all bite-size. I guide you, step-by-step. Relief that lasts: It’s like finding gold. 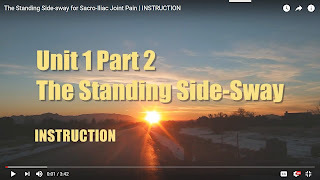 Google ranking of this entry has made this entry more visible than the entry that should have preceded it, Understanding Sacro-iliac Joint Pain | Stopping the Pains and Weird Symptoms, so I’m giving it to you, here. 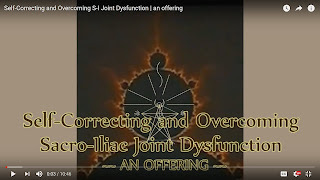 Read it to understand sacroiliac joint dysfunction and why this regimen works. Alternative 1: uses electromagnetic (radio) energy to burn/cook the nerve to kill the pain, but does nothing to correct the cause of the pain. Nerves usually regenerate, so this procedure must be redone every 6-9 months. Alternative 2: makes permanent changes to (usually one) sacroiliac joint and alters movement, with no guarantee of relief. Expense, post-surgical pain and recovery time are involved. This regimen is an alternative to surgery with no negative side effects. It sufficiently improves comfort and function to make you fit and comfortable for all activities, including heavy lifting. Improvements are long-lasting. However, it does have side effects: positive side effects. You end up feeling better put-together, more robust, stronger and more agile than before the symptoms set in. So you have two general options: costly options with negative side-effects or which need to be redone, periodically — and — a cost-effective option with no negative side effects and with positive side-benefits beyond mere recovery. It’s your choice. 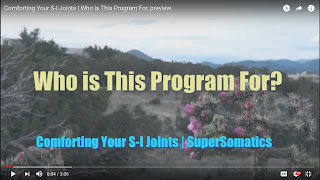 This program, Comforting Your S-I Joints, which you may start immediately, clears up sacro-iliac joint pain and attendant weird symptoms more completely than joint fusion surgery, more effectively than cortisone shots, TENS (electrical stimulation), pain meds or manipulative therapies, and more lastingly than RFA (burning the nerve). 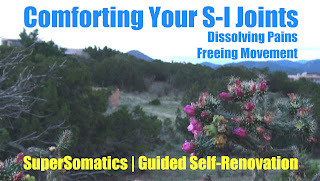 It dissolves pains and makes movement easy, better balanced, and more efficient. Muscle/movement memory changes. Postural changes occur. It’s more cost-effective than any of the alternatives named. This approach works because bones go where soft-tissue pulls them. This program systematically changes the shape of the pelvis (which includes sacrum) by changing the weight-bearing and postural forces of the soft tissue. Changes accumulate and symptoms disappear, with practice, with feel-able changes during and after each practice session. Face-to-face, live-on-line mentoring, needed by a minority of users of this program, is available. 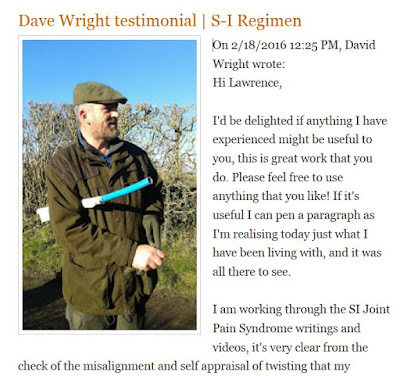 The email address to request a mentoring consultation exists at the end of every section of the program, Comforting Your S-I Joints. The general approach of therapy is to regard the cause of a symptom as being at the location of the symptom. With the symptoms named above, when they occur in combination, that’s not the case. The cause is elsewhere — in this case, from the sacrum being twisted with one sacro-iliac joint being jammed, and sometimes (more rarely) both sacro-iliac joints. The symptoms consist of radiating pain, nerve pain, muscular pain, and unnatural patterns of joint and spinal compression, all of which come from the twisted sacrum. The pain of the twisted sacrum triggers muscular cringing responses, potentially anywhere in the body, and untraceable (i.e., undiagnosable) by looking at the locations of the pains. Addressing symptoms as if their cause is at their location is generally unsuccessful; the successful approach involves correcting the position of the sacrum. Manipulation of the sacrum is a case of “addressing the symptom at its location” and is a limited benefit. Normalizing the muscular and weight-bearing forces that are keeping the sacrum twisted causes it to straighten and to resume its healthy mobility. As the sacrum straightens, symptoms decrease and disappear. The shape of the whole pelvis — and mobility — normalize. You don’t need to keep any of this in your mind or make any effort at all to remember it. Just understand it, once. You may find yourself imagining what I’m describing or remembering it, in yourself. The design of the program does the remembering, for you. Each exercise produces specific effects, described in the introduction to each exercise. These effects become obvious after some repetition and movement-learning — usually one or two practice sessions. The exercises combine like the pieces of a jigsaw puzzle to produce the result. Expect relief from particular symptom when they’re specifically noted in that exercise’s introduction. Expect a general trend of improvements with some “ebb and flow”. You’re dealing with muscular tension habits that you must deconstruct and then reconstruct into a healthy pattern. It’s a process that reprograms muscle/movement memory, for better muscular control that lasts, rather than a series of quick mechanical adjustments (that don’t last). These are programmed movements — action patterns — that reprogram muscle/movement memory in ways you can distinctly feel. Never stretch. Never do these exercises as stretches. Avoid stretching. Always work within your range of comfort short of any cringe response. ARE THESE EXERCISES PAINFUL and DO I WORK THROUGH THE PAIN? For a person in good condition, these exercises are entirely comfortable, to do. Pain is a sign of the trouble you’re in — and the difference between pain (as I use the term), and “intense sensation”, is the cringe response. If you find an exercise pattern painful enough to make you cringe, you’re not ready for it. Skip it, for now, and continue through the rest of the program. Working with these exercise patterns while cringing and forcing through pain is counterproductive. As you cycle through the program, the other exercises will prepare you so that you are comfortable enough to do the previously painful exercise without cringing. Never force or “work through the pain”; cultivate control within your non-cringing comfort zone. You will feel changes in movement and balance almost from the beginning. If you don’t feel improvements from a given exercise in one or two practice sessions, either you don’t particularly need that exercise, you need preparation from the other exercises, or you were doing it differently than as described in the instructions. It doesn’t matter; do the whole program, as given. Mentoring helps to speed your improvement. This program came into existence from correcting my own S-I joint dysfunction. I had pain in back at waist level on the right side, pain around the rim of my pelvis on the right, deep “gluteal” (buttock) pain (which wasn’t muscle pain, but referred nerve pain), pain deep in my left hip joint, sciatica-like pain in my right calf (which wasn’t typical sciatica, but came from a jammed sacrum), and other very unpleasant symptoms that I describe in my entry on Understanding the S-I Joints and Stopping the Pain and Attendant Weird Symptoms. I was like a poster-child for S-I joint pain. A few people I have worked with have had symptoms worse than mine — most, not. to remove forces that simultaneously twist and compress the sacrum or twist the ilium (side-hip bone) in relation to the sacrum. to repattern coordination of muscular force for symmetry between right and left sides to cause the pelvis to become symmetrical — and so untwist the sacrum. Observing my own sensations, I noticed that muscular contractions and discomfort occur in many locations in reaction to a twisted sacrum, as far as the base of the head or jaws; they were reactions to the pain I had in my pelvis. Those contraction reactions keep the sacrum twisted or return it to a twisted position — hence the number of exercises that address different locations in you. I started with Gentle Spine Waves — done with respect for my own tolerance, never making myself cringe either from pain or from expectation of pain. I was in delicate condition, so I treated myself delicately. I developed other exercises, some of which I refined to make them more efficient and others of which I replaced with better exercises. Gradually, I discovered more movement patterns that addressed more aspects of the problem. So, the program evolved into its present form. First note: It’s best to do this program last-thing in the day, so sleep is next. You’ll sleep better and tissue growth that occurs at night will be in the better pattern brought about by the exercises. This program consists of somatic education exercises done in a specific order. You don’t do all the exercises in one sweep (which is why I divide the instruction into sections of practice); you do the exercises in entire sections, as described, below. The exercises are entirely comfortable to do for anyone in good condition; pain is a sign of a movement problem that the program will correct. As you work through the program, if a certain exercise feels too painful to do because of your condition, skip to the next section; you’ll return to the too-painful exercise as you cycle through the program and likely find that you can now do it comfortably — and if not, skip it, again. Each exercise sets changes in motion that progress for some time after practice. Some decompress your S-I joints, so the other exercises can work; some self-correct your coordination, so the forces that position your sacrum change direction; some flush up existing problems so you can correct them as you cycle through the program; and some integrate and consolidate the improvements that have occurred. As in a recipe, no one ingredient constitutes the entire recipe, no one ingredient, but the whole recipe, produces the result, and there are steps of preparation. Each somatic education exercise may be viewed as an ingredient and the program, as the recipe. The program takes you, step-by-step, through your self-renewal, back to life free of pain and in robust condition. Too tired to do them? That’s a sign you need them. Do them, anyway. You’ll finish more refreshed — not more tired. 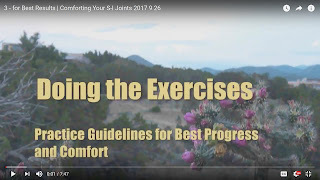 You do the exercises in sections for the number of practice days stated at the opening screen of each section — unless you find it necessary to skip an exercise due to pain, as stated above. 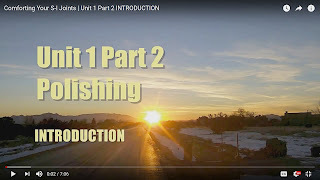 You begin each practice session with all of the exercises of Unit 1, Part 1 and finish each practice session with all of the exercises of Unit 1, Part 2. Very Powerful.The Tongue Mudra is an evolved form of an ancient yogic technique. It involves positioning the tongue and lower jaw in a particular way along with special breathing. This positioning creates internal feeling-connections that cause spontaneous self-corrections of tension, feeling, and posture. It may seem odd that positioning the tongue in some way can cause these effects, but cause them, it does — and I have often felt the effects all the way into my sacrum, as changes of tension and position. It’s very handy and the first thing you should learn in the program. An instructional video follows, below. Start your practice of The Tongue Mudra when you reach that video, on this page. You might do the exercises in this program without The Tongue Mudra and get results, but results occur much more quickly and easily if you use the Mudra during or immediately after practice. There is an exception: the somatic education exercises that involve the jaws (Unit 2, Section F.2); it’s rather impossible to do both at the same time, so you follow the exercise with a few minutes of The Tongue Mudra. Some people have residue from neck injuries. If that’s you, The Tongue Mudra is essential, for you. 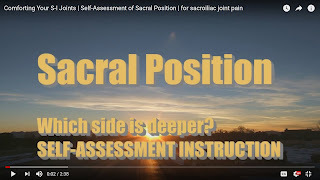 You determine your own sacral position before each practice session; people’s sacrum changes position and you may want to make sure you are doing the exercises for the correct side. A video-tutorial provides instructions. 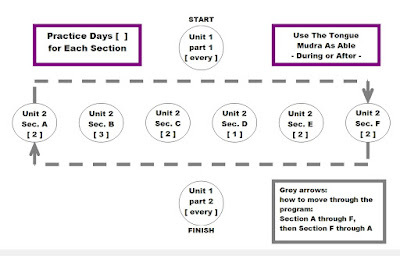 Once you know the Unit 1 exercises, most practice sessions take about 1/2 to 3/4 hour; some take less, some take more. Working from the video tutorials takes longer; when you know the exercises by feel, practice goes quicker because you can get more done with fewer repetitions. You’ll know, by feel. If you get too sore to want to practice, take a break and pick up where you left off, after the soreness abates. Until you’re familiar with the exercises, it’s best to follow the practice guidelines given for each section. How to do somatic education exercises well. Done as instructed in the tutorial above, even by itself, The Tongue Mudra is very powerful at triggering self-adjustments to posture and movement — if you do it correctly, meaning, in the correct position so that you get the sensations described — easy, but specific. The use of The Tongue Mudra when practicing these exercise patterns increases their potency, making larger self-corrections occur more quickly. The use of The Tongue Mudra after practice increases the changes caused by the exercise patterns. Self-assessment is not optional or occasional. You assess yourself each time you do a practice session, and, if you are really meticulous, before and after each exercise (so you can feel the change). Self-assessment is required in order to know on which side to do certain exercises — and that will probably change unpredictably as you do the program. So, check yourself. Get a therapist to teach you how and to confirm your accuracy. If you feel worse after practice, you may have mis-assessed yourself. However, remember that even if you did the correct side, soreness sometimes happens after practice. It may last a few hours before subsiding. If it doesn’t subside within a day, do the exercise for your other side, next. 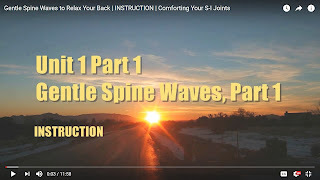 Determine which way your sacrum is turned (left or right side jammed forward) to determine which side is your working side; the introductions to the exercises explain. You’re manually measuring the depression or “dimple” next to the ridges. If one side of your sacrum is “high” or closer to the surface, the other side is jammed. The exercise patterns are designed to correct twists, up-and-down displacements and rotations of the pelvic bones. 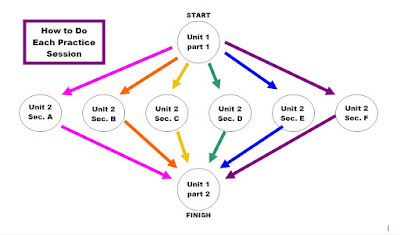 In “abbreviated Unit 1”, you do two repetitions of each movement (instead of five), from memory. 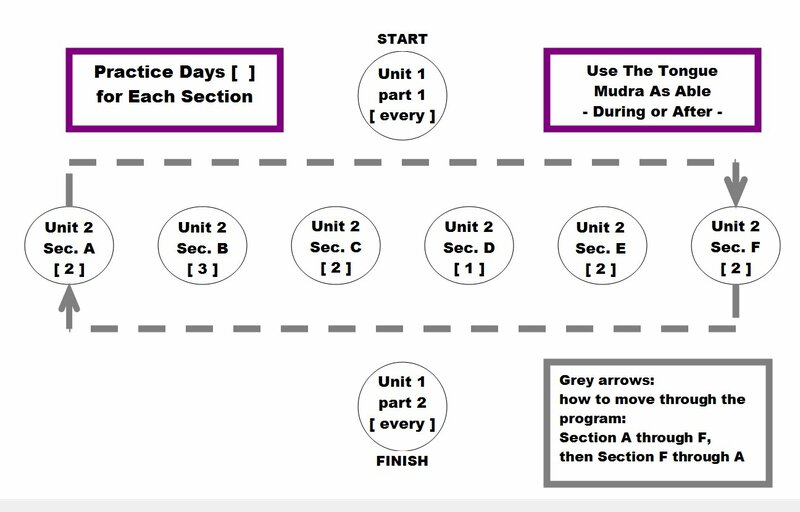 You prepare for the Unit 2 exercises with Unit 1, PART 1 and finish the Unit 2 exercises with Unit 1, PART 2, “AFTER EVERY UNIT 2 or UNIT 3 PRACTICE SESSION”. From the Unit 1 preparatory exercises, expect relaxation and lengthening of the spine of the whole side worked, feel-able as you lie in repose after practice; it prepares you so the other exercises can do their work. What you will feel is a lengthening of the “working” side and decompression of that side’s S-I Joint — preparation for what is to follow. Then, combine Unit 1 with one section from Unit 2, as instructed, above. 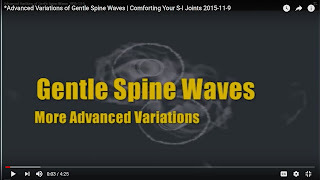 Gentle Spine Waves is an “unlocking” step that loosens your back tension so you can make other changes. The additional looseness makes it easier for things to shift to a new position. Start with the deeper side up; this instruction will make sense once you’ve followed the video-tutorial, the first time, not from reading these instructions or just viewing the tutorial video. 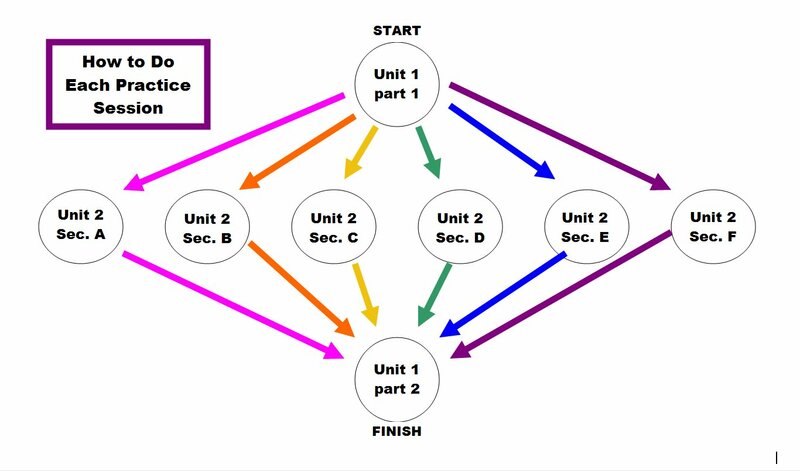 When working Unit 2, you do Unit 1 as preparation for each Unit 2 section. You are unlocking the situation so the Unit 2 exercises work. CLICK THE IMAGE, FOR ACCESS. The exercise instruction videos you’ve seen, above, are enough to get you started on the program, so you can evaluate its effectiveness, for you. On the rest of this page, you find the exercises that constitute the rest of this program, what to expect from each exercise, and links to the access page for the entire program. By now, you are much more comfortable and mobile. You may notice that it’s hard to tell which side of your sacrum is deeper or which side moves more easily. That’s when you start UNIT 3. If you get stuck, don’t worry. I offers both one-time and ongoing mentoring consultations (paid, with a satisfaction guarantee). Visit http://somatics.com/page7-consultation.htm to schedule. Lawrence Gold is a certified clinical somatic educator who has been in practice since 1990. His clients are typically people in pain who have not gotten help from standard therapies. Contact Lawrence Gold, here. Read about his background, here. This article was originally published at Full-Spectrum Somatics. Reprinted with permission from the author. You can end your own pain, and be better than before. Apply yourself to your somatic education. 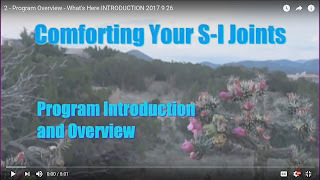 This entry was posted in exercises for sij dysfunction, rotated sacrum, S-I joint pain, sacroiliac joint dysfunction exercises, sacroiliac joint dysfunction treatment, sacroiliac pain exercises, sacroiliitis exercises. Bookmark the permalink.